The Best Western Plus University Park Inn & Suites is ideally located in the center of Ames. Come and experience our hotel near the major tourist attractions. Best price guaranteed and exclusive deals. Welcome to the Best Western Plus University Park Inn & Suites! Take a break and relax in our comfortable lobby! Start your day off right with our complimentary hot breakfast! The living room of this suite type features a queen size sofa bed, dining table with chairs and TV. The living room of our executive suite features a TV, microwave, refrigerator and sofa bed. You won't feel cramped in the spacious guest bathroom of our presidential suite! Take care of your business needs in our conveniently located business center open 24-hours a day! 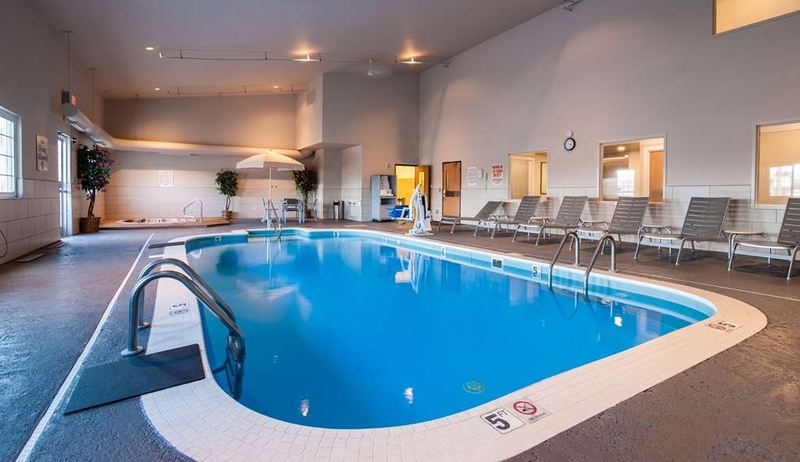 Enjoy our indoor heated swimming pool and hot tub year round! Our conference room features all of your necessary audio/visual equipment including a TV, VCR, DVD and built-in screen. 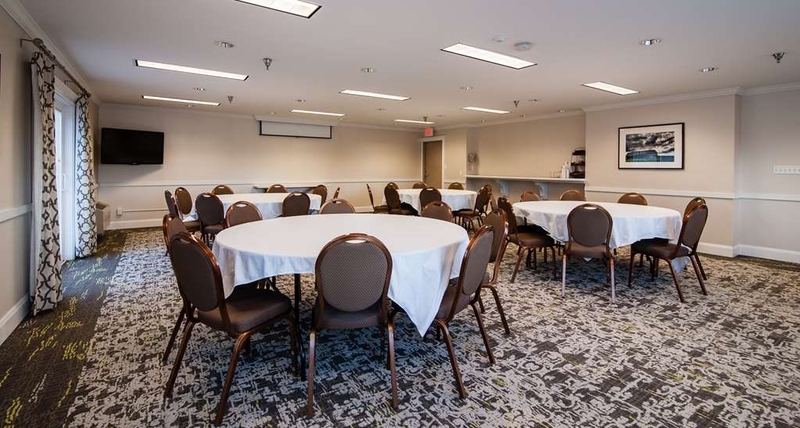 The conference room can be rearranged for your meeting needs. 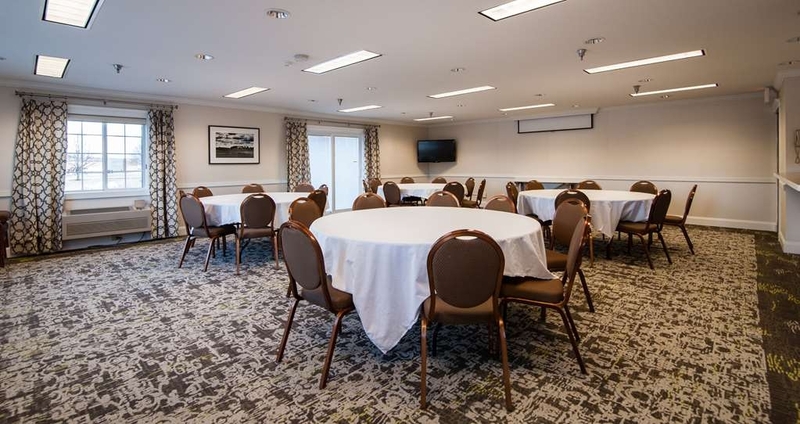 Our conference room is perfect for your meeting. It can hold up to 60 attendees. 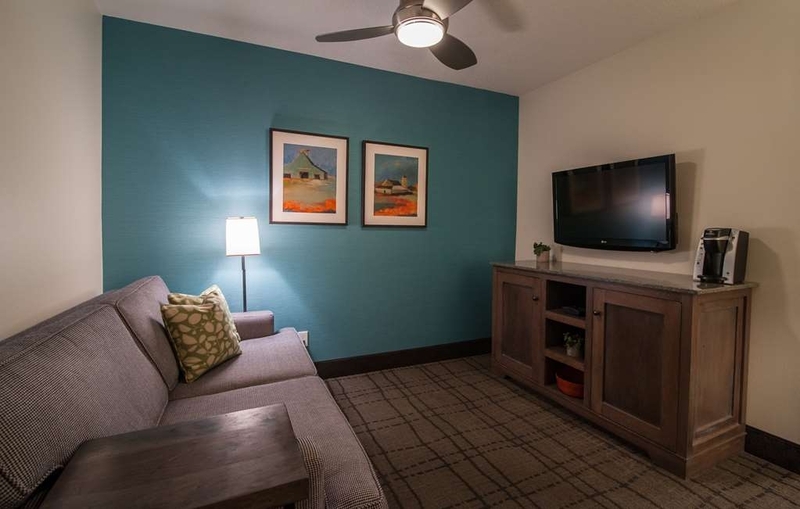 Experience all that Ames, IA has to offer - from Iowa State University to the Reiman Gardens to the bustling Main Street Cultural District - within minutes of this cozy hotel. 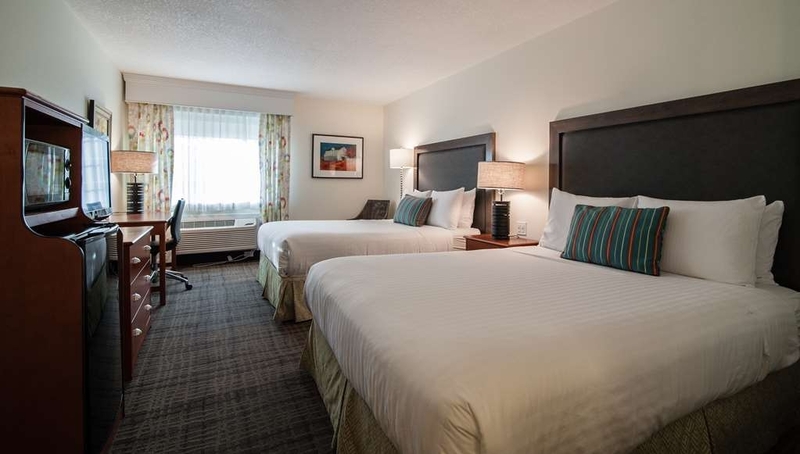 Centrally located in the all-American city of Ames, IA, the Best Western Plus University Park Inn & Suites is the perfect accommodation for friends, families and fans of the Iowa State Cyclones. 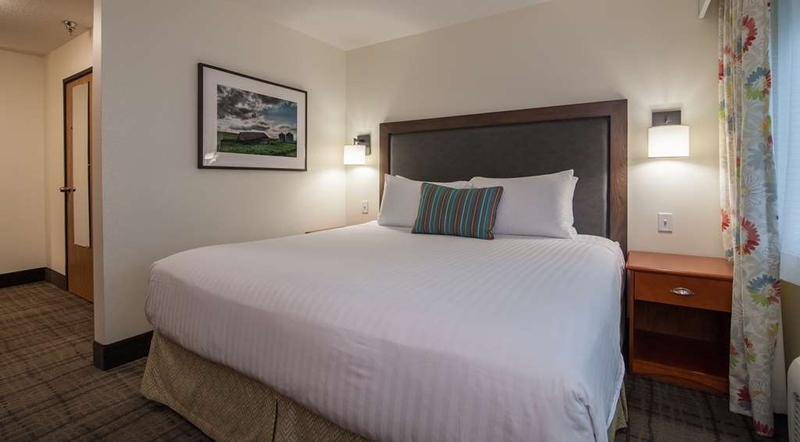 The Iowa State University campus is within a mile of this Ames hotel, offering guests easy access to exciting games at the Jack Trice Stadium and Hilton Coliseum or to a number of events, conventions and shows at the Iowa State Center. The beautiful ISU Reiman Gardens is one of the largest public gardens in the state. Just a few miles away, Ames' quaint Main Street Cultural District offers an abundance of events, dining and shops. Visitors often enjoy a ride on the Boone & Scenic Valley Railroad, while the golfers of the group might tackle the nearby Coldwater Golf Links. Business travelers will appreciate the proximity to the Scheman Conference Building, Iowa Department of Transportation, the United States Department of Agriculture Disease Lab, 3M®, Sauer-Danfoss, Ag Leader and WebFilings. More than 50 businesses are located in the Iowa State University Research Park, just a few blocks away. 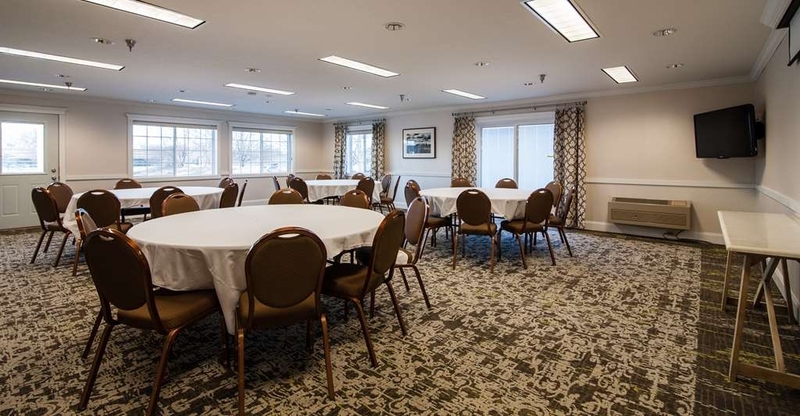 This Ames hotel also offers meeting facilities for up to 50 people. The full-service Best Western Plus University Park Inn & Suites offers 86 spaciously-appointed guest rooms and suites, each equipped with a refrigerator, cable satellite television and free high-speed Internet access. Guests will wake each morning to a complimentary full hot breakfast. 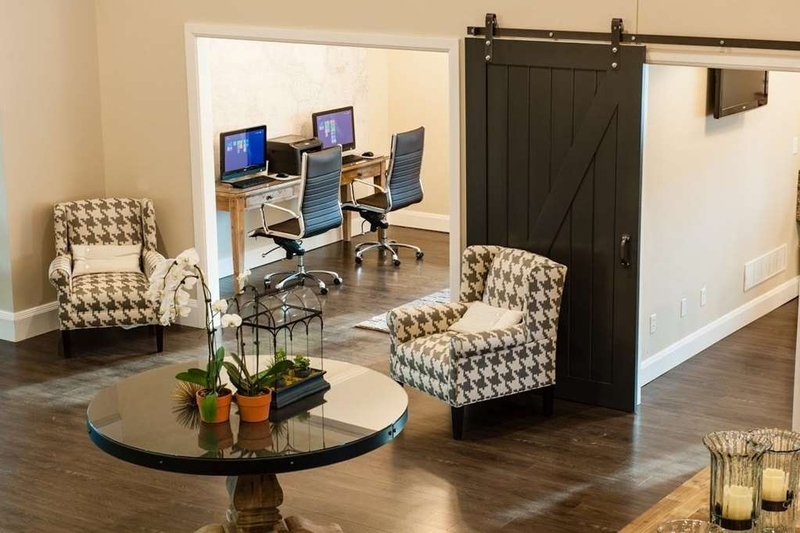 This pet-friendly Iowa hotel also features an indoor heated swimming pool and hot tub, fitness center, 24-hour business center and meeting facilities. For superior customer service and a convenient location in Ames, Iowa, make a reservation today at the Best Western Plus University Park Inn & Suites! "Great place to stay in Ames"
We stayed here 2 nights and would stay here again. The room had everything we needed along with a refrig. A lovely vaulted common area/breakfast room with a beautiful fireplace. Breakfast was great--eggs, bacon or sausage, waffles, toast, yogurt, fruit and the best blueberry scones. This hotel was very clean and I felt comfortable letting my toddler play freely in the room and play in the pool. I noticed an employee taking and checking pool water samples which really impressed me. The breakfast had real eggs. Our only issue was that a hotel guest was having a large party in the lobby Sat evening which led to every parking spot being filled and we had to park and walk from a far away parking lot not belonging to the hotel. "Very nice hotel with Friendly staff"
Very nice hotel. Staff always friendly. Good service, clean rooms, nice pool. Within walking distance to Iowa State University. Restaurants close by. I would recommend this hotel and definitely will stay here again. As a business traveler the office puts us up in IHG, Marriott properties. This stay was the Best Western in Ames,Iowa. What a fantastic stay. Super clean hotels and country decor, the staff are so pleasant and friendly. If your a business traveler going through Ames, Iowa--Stop at the Best Western. You wont be disappointed. We booked this hotel because it's close to our daughter's apartment as she attends ISU. Everything about this hotel was excellent. Check in was fast and friendly. The rooms are spacious, modern and comfortable. And the price was very reasonable. We will definitely stay here again when we visit our daughter. "We will definitely stay here again." We had a great experience. The main desk was staffed by very helpful people who were smiling and greeting us as though we were the most important people to check in. The room was quiet and very clean. No dust on the window sills, not paint scratched or damaged, no carpet stains - it was just very clean. We slept well and had a great hot breakfast before we left. Very impressive hotel. Loved it. "Best Place to Stay in Ames, IA!" We've stayed at several different places in Ames, but found this to be the best! It is very clean, quiet with a great breakfast option and a very friendly staff. Next time I am in Ames, I will stay here again! "Incredible Staff // ISU Animal Hospital Stay"
I was recommended to the Best Western in Ames, IA from the ISU animal hospital. Not only were they incredibly close to the hospital but they offered a discount to pet owners with a pet staying at the hospital. The staff truly made my stay wonderful! I lived that week at the mercy of my pets doctor and each day I was given an update and unfortunately had to extend my stay based off that call. Thank you to the hotel staff for your help and understanding! I hope I won't be back anytime soon but if I am, I'll be staying with you! The hotel has been remodeled except for the pool area. There was NO ventilation in the pool area and several people were falling due to the slippery ground. Rooms were nice and breakfast was good. Front Staff was exceptional. They were VERY helpful. Based on the customer service the employees make the hotel great if that makes sense. I wasn't as impressed with my bed but that being said it is a Best Western. Check in and out very smooth. Room was very clean. Bed comfy. Wifi worked great. Bathroom a little dated but not a problem as clean and maintained. I'm not a fan of the sink and mirror outside rest of bathroom, but maybe that's just me. Good price. Would stay here again. Young man at front desk gave us a great restaurant suggestion for supper: Hickory Park. Excellent. Our motel stay could not have been better. This Best Western is exceptionally clean and the staff goes out of their way to be friendly and work efficiently. The breakfast was great - everyone around us was raving about the scones! The coffee pot never ran out as the help closely monitored all of the breakfast items and had everything stocked. Our room was perfect and I did use the pool and fitness center. "Staff goes above and beyond!" The staff here is very friendly and very attentive to your needs. Sarah in the front office made sure we had the appropriate accommodations for my husband‘s wheelchair. She called the room about 10 minutes after we left the front desk from check-in, and she promised she would, to make sure everything was satisfactory as there was not an accessible room available that fit our needs for a number of people. She made recommendations for dining that were excellent. She also noticed that my daughter liked the plants that were at the check-in counter and offered to bring her cuttings off of her plants from her own home. The common area has a very large table that my siblings and I were able to sit out in the evening to converse and have some drinks. The breakfast is your basic hotel breakfast and nothing fancy. There is an excellent place for breakfast very close by. The rooms were comfortable and clean. This is very close to Jack Trice Stadium, Hilton Coliseum, Iowa State veterinary medicine, and Iowa State campus. This will definitely be added to our go to hotel when we are in Ames. Hats off to the staff. "Great place to stay for the price!" We had a great week at this hotel. Only complaints were dim lighting and flat pillows. At check out, we were told we could've asked for cotton pillows, so if we'd mentioned it earlier we would've had a resolution. Staff was all excellent! Breakfast great. Decor wonderful. Stay here! Excellent experience at this hotel. Room was clean and comfortable, enjoyed the fitness center, pool, breakfast, etc. Staff was friendly and helpful. Would definitely stay at this hotel again. Great job! Very clean room with comfortable bed and the staff is very helpful. I did not have any problem with the WIFI in the room. As far as breakfast the breakfast would be similar at other hotel that I have stayed. I thought the coffee was very good. This hotel is running very well, hats of to the management. We enjoyed our stay here and everything was great from breakfast, room and and check in and check out. Great location as well! Very clean hotel. We had a problem with our door lock our first night and they gave us a new room right away not problem with out having to move to far away. Nice to see them fixing the problem in the room the next day so the problem will be resolved. "Nice place to rest up for a conference"
Really enjoyed this location. Had everything I needed. Friendly check-in / check-out staff, good breakfast, great breakfast hostess staff. Just came in for one evening, but it was close to the University and easy to find. We normally stay at Best Western when we travel, but I think this location is one of the best so far. From the moment we walked in, the front desk staff was very friendly, professional and made us feel very welcoming. Within 20 minutes of our arrival, we got a call from the front desk asking if we were satisfied with our room. The answer was a definitely "Yes". The room was very clean and spacious. The bed was so comfortable that we almost extended our stay for another day. The location was very close to the highway which made for an easy access. The breakfast the next morning was very nice with many items to choose from which made it really convenience that we didn't have to stop somewhere else for breakfast. We had express checkout, therefore we didn't have to stop at the front desk when we departed the property. This stay was an enjoyable one. Not only was the staff at the front desk friendly and welcoming, the staff in the breakfast area as well as the cleaning staff were too. If you are in the area and looking for a place to stay, I highly recommend this property. "Great place to stay in Ames!" We've stayed here twice in the past 2 months and were made to feel welcome each time. The management and staff are excellent, rooms are clean and pleasant, and location is convenient to everything in Ames. This hotel is in a great location, with easy access. It is an older hotel, but has been nicely re-done at some point. Staff that we dealt with was young and very friendly. Housekeepers were friendly, also. Quiet location, even with nearby highway. Breakfast is typical BW, but with the addition of some tasty pastries from nearby bakery. I would stay here again. Stayed here for family weekend. Nice young folks at the desk. Areas of shower/tub need to be scrubbed better and there seems to be something on the bathroom wall. Bed sucked, just saying. Surprised to see all these dogs through the building- one lady even had her dog in the serving area for breakfast. (Website does say pet friendly so my bad)I thought that was poor judgement on the dog owners part. Asked the desk and they only had two rooms that were designated “no pets” so pets can really be anywhere. Good for pet owners I guess, but likely won't be staying here again. Great location for campus stuff. Very much enjoyed the breakfast, room, cleanliness, staff, pool, and location. No complaints from six of us who stayed in the large family suite for four days and three nights. Enjoyed the city of Ames. The hotel was great for my business stay. Staff was very friendly and helpful. My room was close to the vending machines and the laundry that was available for guest use. would stay here again in the future. Thank you for your review, I'm so glad you had an enjoyable stay with us this September! We hope to see you the next time you're in Ames, IA! "Excellent Stay, 3 Years Later..."
I stayed here in 2015 for a work conference. We are back again for a staff meeting. My room (Single King) was absolutely perfect. Front area of room had a separate TV with a couch and a work station. Bed was huge and very comfortable. Not to hard, not too soft. This is my second time here and I cannot find fault with anything. The hotel has a fitness center as well as a pool. A Route 66 gas station and convenient store is right behind the hotel and a very short walk to get snacks. Bathroom in the single king rooms, are very spacious. Very well kept. Front desk staff gave us ideas for places to visit while in Ames. Very friendly. About 2 hours after I checked in, staff called to make sure room was to my expectations. Refrigerator, coffee pot and microwave in the single king. I hope we are able to come back in the very near future. Thank you for your response, and returning to our property over the years. I'm happy to hear you had another enjoyable stay at our property, and we look forward to seeing you the next time you stay with us! I was Very Pleased with this Hotei except for One Main Issue. The Business was clean and the Staff Very friendly. My room was nice and clean. The Night before I left to catch a Flight; there was a Major Disturbance just after Midnight which rudely awakened Me. At first I thought a Fight had broken out in the Lobby of the main floor. I was on the second floor, approx. 75 yds. from the outbreak.I was to understand this was a Group of People who were Very Drunk. The noise continued for a lengthy time. I finally got up and turned the fan on the A/C unit to mask the noise. I fhought Mgt, would curtail the Problem. NO !! the next morning I asked the Personnel working the desk what was the problem. He stated He could not Control the Situation. LAME !!! 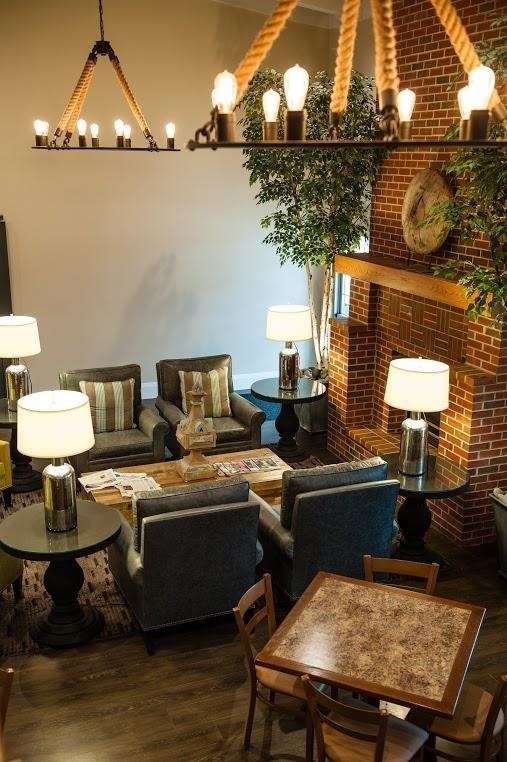 "Great place close to ISU"
This hotel is in a great location not too far from ISU. We have stayed here many times since our daughter started ISU and have never been unhappy. The rooms have always been clean, the beds are comfortable, and it has never been noisy. The best thing about this place, however, is the staff! They are always friendly, helpful, and willing to go the extra mile to help their customers. The workout room/pool/hot tub are fine and there is a nice porch to sit on outside. The free breakfast is adequate although not outstanding, there is something for everyone. Consistently a great stay! "Friendly, great location, excellent staff!!!" 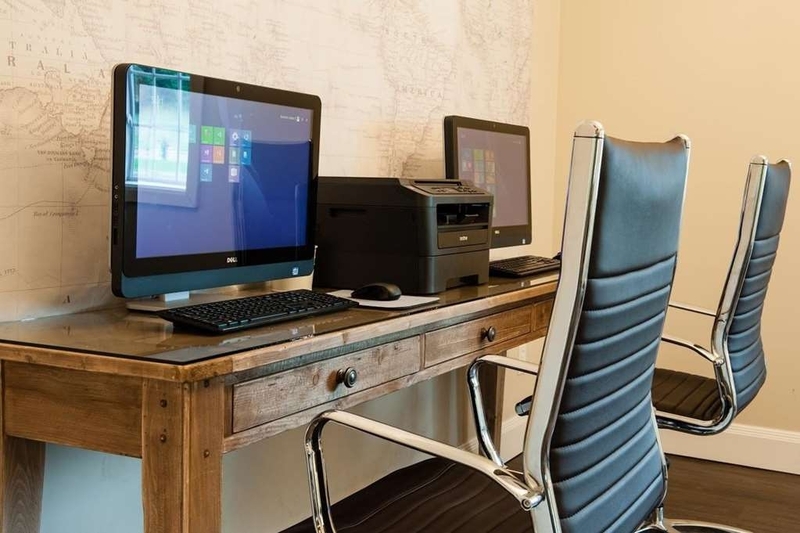 This Best Western Plus is in a super location near Iowa State University but in a quiet neighborhood, and the staff there are very skilled at handling crowds with ease as well as helping each individual enjoy their stay. We would stay again in a heartbeat and would like to thank them for their excellent work in making our visit a joy! Breakfast contained a very good variety of foods, healthy and delicious, and the service was terrific! "Great place to stay if visiting ISU"
Stayed here during a college visit. The front staff was so kind and courteous and went out is their way to make us feel welcomed and answer our questions about the town and provided us maps. The decor in the lobby of very current and spacious. The hotel was at capacity, but it did not feel that way and the room was very nice and comfy. Would definitely stay here again. I was pleasantly surprised at the quality of this hotel. The room was very comfortable and large. The lobby area was very nice. Breakfast was included and was delicious with a number of options. Staff was friendly and helpful. Located in a very safe area. I would highly recommend this hotel for business or pleasure. We stayed 6 nights for a dance competition. All Staff was so friendly and helpful, they really seemed to enjoy working there. hotel was clean, I would definitely stay again. There was lazer tag, miniature golf, game room ,and restaurants close by. Didn't expect this hotel to be as wonderful as it was. Stayed 4 nights during a dance competition in town. Hotel staff greet you every time you come in or leave. Always friendly and informative and willing to help immediately. Spent a lot of time in the lobby and outside on their porches with our large group of families. Variety of seating and wonderful large farmhouse table seated 10 of us so we could eat together. Rooms were clean, bed and pillows comfortable, nice to have microwave and refrigerator. Pool and hot tub perfect. Good location—easy to get anywhere rather quickly. Great restaurant options to go out to, pizza and cookie delivery, and gas station/deli/liquor store across the parking lot! This Best Western is decorated like a farmhouse, from the large front porch with wicker chairs for sitting, the big barn doors in the breakfast area, to the unique pump like spout on the sink in our room. Our room had a very comfortable and large king bed and was very clean. The sink and bathroom were separate for those of you who like to know that. The breakfast was the usual continental fare, pancakes, waffles, scrambled eggs, sausage, bagels, cereal, toast, pastries etc. Well stocked and maintained! The staff was very friendly and the person at the front desk spoke to us every time we passed by!!! Although we didn't use the pool or hot tub the area seemed very clean and looked inviting. There is a convenience store and gas station located right behind the hotel. You don't even have to get out on the highway to get to it. Close to the university. Perfect for what we needed. It was a more expensive room than others in the area, but was consistent with the quality you would expect from a Best Western- a safe choice when traveling to an unfamiliar area. "Clean, comfortable and feels like home"
We chose this hotel for two nights of our two-week road trip because we had stayed there a couple of years ago and were very happy with it. Our room had a living room separate from the sleeping area which was nice and it was all very clean and comfortable. The breakfast was very good with lots of choices and the lobby was beautiful and had ample tables for dining. The staff was so friendly, particularly since we were "walk-ins" and the whole experience was very pleasant. Room was clean, quiet and roomy. Nice restaurant within walking distance. A gas station and convenience store are directly behind the hotel. Staff was friendly and courteous. We didn't use the pool or exercise room so I cannot coment on those. I have rarely given a "5" to any hotel in the world, but our experience here was a "5." The setting is lovely, albeit not very close to restaurants. For those who just want a light snack, there is a Phillips 66 station right across the parking lot. There is a mini-store that has sandwiches and other food items available. We got some sandwiches and small bottles of wine and had a picnic in our room. 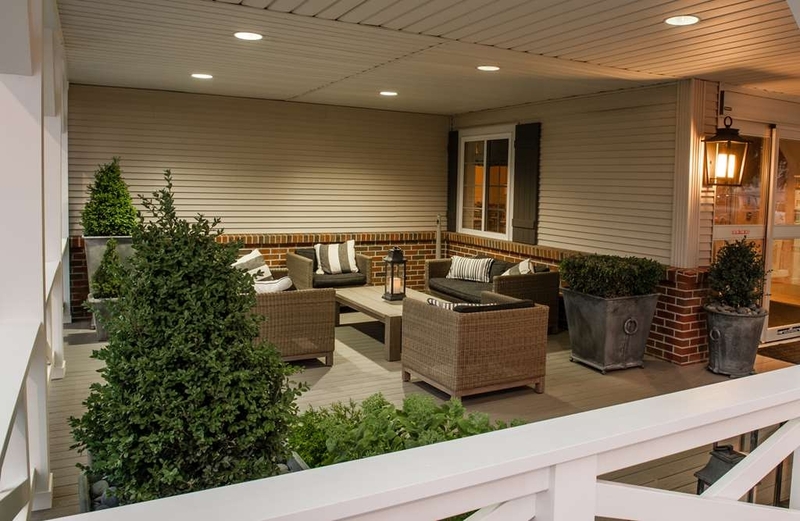 There is a beautiful front porch/patio that we could have used. The lobby is interesting. It looks like an Iowa theme has been included: sliding "barn" doors hide the area in which the breakfast items are served as well as small windows are located high on the one wall in the lobby. The room was clean and comfortably set up. The bathroom had a faucet that I have not seen before: the water comes out on top. This is a nice feature as there is less splashing. The reception staff were friendly. The young man checking us in had a very thorough description of what was available at the hotel as well as telling us the breakfast time. "Great location and great staff." Close to everything and everything was better than expected. Would definitely stay here again and highly recommend it to others visiting the area and looking for a place to stay. Staff was professional and courteous. I was quite satisfied with my recent stay. The room was clean and comfortable, and the hotel is conveniently located. The desk staff were very polite and professional. The room was small, but that's to be expected for a hotel in this price range. Stayed here while attending a conference at ISU. Rooms are very well kept and spacious. Continental breakfast was good and well beyond the “average” hotel breakfast fair! Will definitely stay here again the next time I'm in town! "Good place to stay in Ames"
Room was nice. Easy to manage the air controls. Shower was good, bathroom was nice. Didn't watch TV. Pool was cute, hot tub was clean and hot enough. Breakfast was fine- eggs were really good, as was the oatmeal. Lots to choose from. Coffee was fine. The staff seems to be mainly college students, so their level of dedication is not as high as you'd get in a non-college town. Leadership seems to be lacking with in the staff. However, they were friendly enough, just not very hard-working. The weather turned pretty awful, and the staff didn't seem to recognize the need for shoveling the walk outside the main entrance. It was pretty slippery and sloppy outside. We stay often in Iowa and will be using Best Western going forward. Friendly staff with great service, and great room! We very much enjoyed our stay and look forward to staying again in the near future. "Comfy stay in Ames, Iowa"
Convenient, clean, and practical. Friendly staff and thought the breakfast offered was good. I was there for a business trip. Felt I had the needed amenities to have a good stay and felt it was a good value. Thank you so much for your positive feedback regarding your recent stay with us! We strive to give our guests an enjoyable and comfortable stay, and I'm glad we achieved that here. We hope to see you for your next visit to Ames! Stayed for one night while visiting Iowa State. Hotel is easy to get to and staff was extremely friendly and accommodating. Nice gym area with plenty of equipment. Pool & Whirlpool are comparable to other hotels. The hotel appears to have been updated recently and decor is stylish and welcoming. Breakfast had multiple options available and hotel staff stayed on top of making sure everything was stocked. There is a convenience store located right off the parking lot so it was very convenient to get snacks/drinks. We ended up leaving a pillow and electronic device behind and we received a call to let us know. Thank you very much! I will definitely stay here again if we are in the area! Thank you so much for you positive feedback regarding your stay with us! I'm glad you enjoyed your stay with us and we hope to see you again for your next stay here in Ames! I do apologize for the noise during the night of your stay. I'm glad we were able to resolve the issue with you, and we hope to see you in the future! Thank you for taking the time to review our property! I'm so glad that you enjoyed the changes we made from our remodel, along with the hot complimentary, continental breakfast! We hope we will see you for your next trip to Ames, IA! We stayed at the Best Western Plus University Park Inn and Suites. Very clean, great breakfasts, work-out room, helpful staff. Part of our stay occurred when the temperature was minus eight degrees. We were warm and toasty in our motel room. Thank you for the positive comments regarding your stay! I'm glad you were able to warm up here during one of the coldest times of the year. We hope we will see you in the future! "Staff makes this property fantastic." This hotel is what you'd expect - clean, warm, nicely decorated. What sets it apart from other hotels that are fine is the engaging, friendly and knowledgeable staff. Any question? They can help. Forgot something at home? Of course they have it! Easy access to University and Highways. Great price. We appreciate all of the kind words regarding our property! Thank you for staying with us, we hope we will see you in the future! "Our first choice when going to Ames"
My son attends college in Ames. We've stayed at many hotels in the area. Best Western by far has worked out to be the best value for our dollar. Im not found of paying the jacked up prices on game wekends. This is an excellent hotel choice in Ames. Quieter part of town that's close to Campus and offers easy access to Hwy 30 and I-35. It's a short drive to popular restaurants and shopping. Easy walk to the stadium. Attractive, well-kept property. Clean rooms. Pleasant, friendly staff. The pool looked inviting. While there are other nice hotels in the area, you won't go wrong staying here for whatever brings you to Ames. I was very pleased with my stay. Thank you for the kind words regarding our property! We hope we will see you in the future! 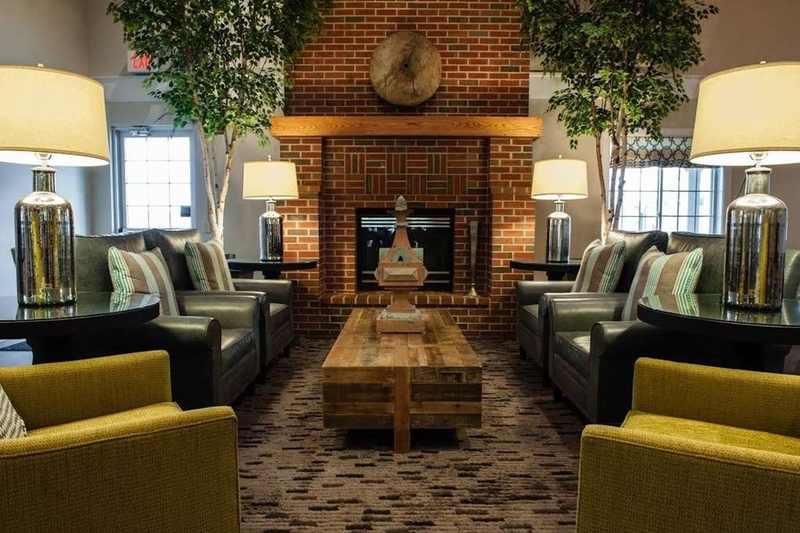 "Pottery Barn meets Best Western"
Thank you for the kinds words regarding our staff and decor! I'm so glad that you and your wife enjoy staying at our property! We hope we will see you both in the future. "Best Western really was Best"
Clean facilities only out done by the caliber of the staff. Truly interested in doing above and beyond to make it a pleasant visit. Each person seemed to look for ways they could make the stay comfortable with a personal touch. Thank you for taking the time to review our property! We appreciate the positive comments regarding our staff! We hope we will see you in the future. Of the three other hotels I've stayed in around Ames this was by far my favorite. The rooms are great. The front desk staff are really friendly and so helpful with anything I needed. It also felt quaint, like home. Breakfast isn't the best, but it's acceptable. Thank you for taking the time to review our property! We appreciate the positive remarks regarding our staff. If there is anything in particular you would like to see added to our breakfast please let us know and we can look further into the request for you. We hope we will see you in the future! I will keep it short. The hotel was very nice, clean and the staff professional. The rooms are much better than average and the beds comfortable. Breakfast provided a variety of options including hot food - good quality. The pool are looked nice - didn't go swimming though. I would stay here again without hesitation. Thank you for taking the time to review our property. We appreciate the high marks and comments regarding our staff! I'm glad you enjoyed your stay along with the breakfast. We hope we will see you in the future! Everything was top notch. Couldn't speak more on the professionalism of the staff. Very willing to help at every point of my stay. The staff would greet me in the hallway, offer to give me points on the surrounding opportunities in Ames, and talk shop about the current Cyclone victory over TCU, which happened to take place during my stay there, and I'm a huge NCAA fan. Informed staff on all things Ames, Ia. Hospitality was unmatched in any hotel I have ever stayed, and I've traveled quite extensively. it's an interesting and rare find in the middle of corn field Iowa. If I had to give it a 1-5 star rating, I would give it a 20 star rating. Thank you for taking the time to review our property! We appreciate all of the kinds words and positive comments regarding our staff and your stay with us! We hope we will see you in the future. "Great stay in a Farm House feel Hotel"
My husband and I stayed here for a quick weekend trip for a conference and it was so nice!! The breakfast was amazing! Oatmeal bar and Yogurt bar.. YUM! It feels like HGTV when you walk into the hotel and feels so cozy. We had troubles with the website we used to book (third party site) and it was a big mess but the hotel staff was so helpful in getting things figured out. We hope we "have" to stay in Ames again to stay here!! I'm glad you enjoyed our remodel! Thank you for staying with us, and give us a call if you return to Ames. Great location, darling decor, comfy & cozy. Will stay here again! Two night stay to visit college student and enjoy a football game. Had a minor issue with the shower drain, which was promptly addressed to our complete satisfaction. Glad we found this place. "I can't remember the names of the two young people that checked us in but I can guarantee that if all of your staff were"
I can't remember the names of the two young people that checked us in but I can guarantee that if all of your staff were as pleasant and helpful like these two young people your business will continue to flourish. I do have to say that in all of the hotel stays we have had that this was the best and the staff that checked us in were awesome. So often young people come across like you are a burden to them and these two were just so kind. Please find out there names and give them some recognition,and if your other staff need training put these two in charge. It was a young male and female that checked us in .In closing I simply cannot say enough good things about the check in experience that we had . We will definitely stay there again. Very comfortable rooms. Nice hot tub although it was a little small. Very good breakfast. Very helpful front desk staff. We asked for recommendations on where to go for supper in the area and they made some very good ones. The hotel is very close to Iowa State. The purpose of our visit was to visit there with our son. Friendly, helpful staff, good breakfast...loved the waffles- they also had a large variety of breakfast items, good location, quiet. Roomed smelled of old smoke even though the hotel is no smoking. Apple's in the lobby are pretty but think about replacing them, should be real for guests. The hotel overall was nice. My niece had spent a lot of time, effort, and expense to make gift bags for her guests at the hotel. Those bags were not handled out to the guest as requested. I myself had to ask for ours. The guest in the room above us were so noisy they shook the light fixture outside our bathroom. The Best Western brand has really turned it around. Felt like I was staying at a Hilton Garden Inn, only better! Staff was phenomenal! Polite, friendly, just great! When I asked where to order pizza from, they had a print out with the favored places and their numbers! The beds were amazing! The rooms were well laid out. The pool and hot tub were nice. Nice clean exercise room too. Hotel was clean, room was comfortable, and staff was welcoming and friendly. Highly recommend to others. Hotel is easy to get to and within walking distance of ball games at ISU. Had a nice gas station in the back and couldn't hear a single car all night. "OK for a stay, but could be improved"
They had not king beds available for our stay (even though that is what was booked) and a room overlooking the gas station mad for a more noisy stay. The rooms where clean and tidy, though having the basin in the room is always unusual. This BW had a very pleasing and clean appearance! We loved the decor, cleanliness and comfort. The nearness to ISU/Jack Trice Stadium was excellent. We even walked home after the game. The staff was courteous and welcoming. We will go back for sure! This facility has been upgraded with a country design. Now has an elevator, plenty of porch seating and efficient eating area with centrally located business center, Not is an old unused room. Located off of US 30 with easy access and lots of parking with a gas station/convinient store in the back yard. Rooms are roomy and comfortable with excellent beds. Available inside pool, hot tub and exercise room. Eating area seems small during the weekends when quests sit around during the breakfast areas not allowing other seating to eat their meals. The 3 mornings we were there the hot foods were cold including the coffee. "Best Western - very nice!" We enjoyed our stay at the Ames Best Western. It was comfortable and clean. The staff was very courteous. We would definitely recommend it. The location was perfect for us to do the site seeing we wanted to do. The breakfast was very good. If we are in the area again, we would return to this motel. Thank you Ames Best Western! "Great hotel experience in Ames, IA"
I was very pleased with the Best Western in Ames. The staff was extremely friendly and efficient. The room was quiet and comfortable. Two newspapers were were available each morning in the breakfast room. All the hotel staff we encountered were friendly & helpful. Lobby, rooms and common areas were all clean. Bed was quite comfortable, much better than most hotels I've stayed with. We were also provided rags for our motorcycles as requested. The desk personnel were very helpful in suggesting a route to view the total eclipse and a place to dine. The room was excellent and the location just off Route 30 was great for avoiding Des Moines interstate traffic. Not much else to say other than that I would recommend it to others staying in the area. "Friendly helpful front desk staff"
Excellent front desk staff- articulate friendly helpful and welcoming. Hotel was clean and quiet. Would highly recommend. Close to the southern part of Iowa State University Campus- near football stadium. Only one restaurant within walking distance. Need a car. Several places deliver food to the hotel. Staff readily provided a list. "Excellent location at Ames, IA"
"Best Western Hotel..at its BEST!" This was our third time staying here and it is simply a really nice hotel with nice staff and I have always found it to be very quiet. The rooms are nicely decorated, the breakfast is very good. We stay here to visit our college student and it works perfect! We have used the hot tub and pool as well and that area is nice, too. The Best Western in Ames was a wonderful place to stay. The hotel was new, clean and comfortable. The room was well designed, appointed and the right size. The hotel being pet friendly was a big plus. "Good place to stay near campus of Iowa State Univ." 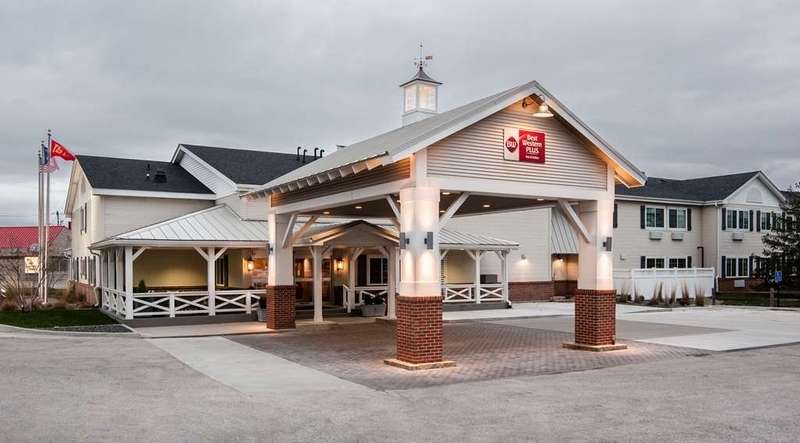 The Best Western Plus Hotel & Resort at 2500 S. University Ave in Ames, IA, is a very good place to stay if you happen to be conducting business or visiting on the campus of Iowa State University. I very much enjoyed my experience there, and the staff was extremely helpful. Thank you! We recently stayed at the University BW Plus. The location is perfect for ISU visits--just down the street from Jack Trice Stadium. The staff were very friendly and helpful. Our room was a double queen, and was very comfortable! I love the lighted mirror above the sink. Breakfast was good, but could improve a couple details about breakfast--nothing major. Decor around the hotel is pleasant and soothing, except for the ugly 2nd floor hallway carpet (another minor detail). We love staying here and have booked another visit next month at this location! Haven't used the pool or exercise room. Have stayed at this hotel several times before and make a point to stop when going through Ames. One of the few hotels I will sit on the porch or relax in the lobby area with the paper. Dated furniture in the rooms, but comfortable and clean. Nice TV, very clean bath and comfortable bedding and pillows. "Breakfast included but needs to change it around "
I have beens staying at this hotel for the past 5 years while my children have been at Iowa State. The hotel is clean is nicely decorated, very clean, fabulous public areas to sit and relax or gather with friends. The rooms are also very clean and bed are super comfy! The staff is the nicest staff I have come across, always greet you with a friendly smile and ask if you need anything. They will go above and beyond. The staff at this hotel was great, they were very kind, acommodating, and flexible. They were available during all hours and the hotel is super nice/recently remodeled. 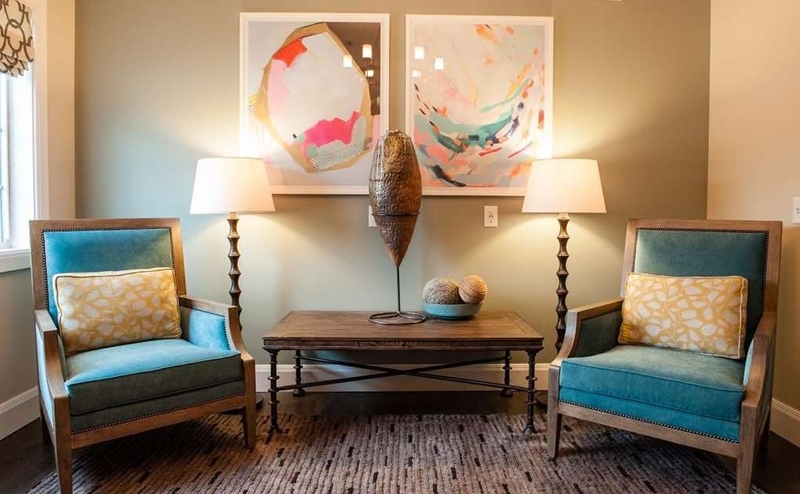 Entryway is perfect for gathering family before an event:). Really nice place to stay. Clean rooms. Nice facilities. Nice breakfast available in mornings. Staff was always friendly. Welcomed you coming in an thanking you on the way out. Kcup coffee in room is nice touch. Friendly and efficient staff. Comfortable rooms (I stayed at one of the rooms with kitchenette and living area), clean and very quiet, especially considering the proximity to the highway. Walking distance to a gas station with a mini-market. I visit Ames often and stayed at multiple places, including bed and breakfast that costed a lot more. This is the best accommodation I have found in Ames and from now on I will try to stay in this hotel. The staff is great. Was in Ames for the Iowa Summer Games. I appreciate that Best Western supported the Games by donating rooms for commissioners and officials like myself. Hotel staff was friendly, accommodating and professional. Property was immaculate inside and out. Will stay here again if in Ames. We stayed at this hotel for two nights as part of a wedding party. All of the staff was extremely helpful and pleasant to work with. The hotel looked like it had been recently remodeled. The room was very nice and clean. Great place to stay! We had a large group and hotel/staff was very courteous and accomodating. They allowed us to use the lobby for a team dinner. There is also a nice little patio area for parents to sit right next to the pool area. "Great Staff and Emaculate Rooms!!" Stayed their for one night, the rooms are very nice and clean, staff service is on par and they are very accomodating. Housekeeping does a good job at cleaning the rooms cant find any problems, we have been coming every year for the past couple years and you guys did a great job renovating this property keep it up! very nice hotel, clean, nice lobby, people very nice, excellent continental breakfast. with pool and jacuzzi, great value for price. located next to Iowa State University. Free bicycles to ride, large rooms, large parking lot, and next to Phillips 66 if you need after hours snacks and gas. We will stay at this hotel if we find ourselves in Ames again. The room was very clean, the bed comfortable. The breakfast was to be expected for a hotel breakfast, not fancy but filled you up for a day of driving. The staff was super friendly and helpful. My daughter loved the pool! The location of this hotel in Ames, IA is great, the lobby is very welcoming, and the staff is very nice and friendly. We had stayed there before and had a very nice experience. This last time, though, the first night we could barely sleep because of the noisy neighbours. Also, this time the room was smelly (musty) and humid, the air conditioned was either too cold or insuficient and very noisy... and the breakfast was not as good as the other times (the only fresh fruit were some flavourless red apples). It would have been great to have at least some fresh bananas! "Unexpected surprise from Best Western"
Reserved a room on the road. Took a chance that the price did not reflect the quality. It certainly was a surprise to find this clean, well staffed, nicely furnished property not far from I35. It's about time that a hotel chain price pointed rooms for just us overnighters. I don't use a pool, hot tub, playground, meeting room, etc., so I don't like paying for them. This property allowed me to sleep in a very comfortable bed with crisp, soft sheets, take a shower (no 5 star because there were two long black hairs stuck to the shower wall), use a fridge, grab some coffee out of a Keurig machine (I don't use those other awkward little single cup thingies), and get a little protein in me before hitting the road again. The furnishings in the lobby/breakfast area were particularly appealing to the eye and comfortable to sit in with my coffee and iPad. I enjoyed this facility so much, I booked my next night stay over in Crawfordsville, IN with BW. Last time we stayed I wrote a review mentioning the thin walls by the conference room. This stay we were on the second floor very near the front desk and we were very pleased. Our room was clean, quiet, and convenient to the stairs and elevator! The breakfast is still quite good and the staff continues to be friendly and professional. We will continue to stay at this Best Western while in Ames...now we know to request a room nearer to the front desk/lobby area. We were here for a basketball tournament. Very convenient location. This hotel is very nice, clean and has very friendly staff. Nice, comfy beds! Slept better than usual for a hotel stay. The complimentary breakfast was a bonus! I would definitely stay here again!!!! Great Family Friendly Hotel. Took my daughter for college orientation. Check in and out was fast and friendly. Nice amenities - they have a pool and exercise room - especially when you traveled for two days. "THE place to stay in Ames"
It was all for the summer graduation day of my son. We reached Ames from Cyprus, Abu Dhabi and Guatemala (and, by the way, we are all Italians) hoping to find a decent place to rest after our long trips and not expecting anything more. Well, this was more, much more! The position is strategic, close to Jack Trice Stadium, besides a petrol station and next to the major highways. At the reception we met exceptionally helpful and courteous staff, ready to help us in any possible way (they managed to fax in a special way an important document, to find an extra scale for our luggage, and much more). The lounge is pleasantly spacious. In absence of a restaurant, we were allowed to dine there bringing our own food, and to let our small nieces play with no constraints, enjoying even a (noisy...you know, kids are kids) mini-birthday evening party. There is a well kept indoor swimming pool and a reasonably furnished gym. The rooms were impeccable and quiet. The free wi-fi service never let us down. Express check-out was without surprise as expected. The only regrets are that we won't have the opportunity of coming back and that I had not enough time to sincerely thank the management for the high quality of our stay. We are pet friendly and do have a pet policy that is given to all guests who check in with pets. This is to ensure that all of our guests have a positive experience. Our property requires that pets are not in public areas like our breakfast serving and seating area, our pool, and our fitness center. Pets are not able to be left unattended in a guest room and also must use a designated area outdoors near our pet cleanup post. These policies allow for guests to travel with their pets but also not interfere with guests who do not choose to travel with pets. Our manager did contact this guest and refunded the tax that was accidentally posted on their pet fee. When you can find the time please review your charges and if there is a problem we will gladly help resolve it. A manager will be happy to speak with you again. Thank you. Room and lobby were well maintained. The hotel looks like it had been recently renovated. Breakfast was ok. Wifi did not work, but I used my phone instead. Beds were clean and comfortable. AC was a bit loud but worked once I figured it out. Fridge actually worked - froze ice packs and kept my drinks really cold. Close to Iowa State. I would stay here again. "Ames Iowa best kept secret!" This breathtaking beautiful hotel has been recently renovated and is stunning! The welcoming lobby immediately makes you feel like home away from home. The rooms are gorgeous, very clean and well kept. The included homemade breakfast is superior quality with a plethora of choices for any dietary needs or desires. My spouse states this is the best value breakfast anywhere and he travels frequently!!! This hotel is a great place to gather as family or for business meetings. The staff is attentive and ready to serve you.Every time we need a place to stay while traveling, this is our first choice. You will not be disappointed! You may want to make this your destination and weekend get away for no reason at all. Best Western Hotel in Ames is a very nice place to stay! I was pleasantly surprised when I couldn't get a room where I normally stay in Ames, Iowa and opted for a room at Best Western. The décor, food and accommodations where all very nice and the price was great too! Very clean rooms and lobby area. The continental breakfast has a little to be desired, but we got what we needed. The staff was very friendly and helpful! May I add again, very clean! So important! A nice stay. "Adjacency to trans and Iowa St."
"Best Western, Ames, IA-great place for family gathering!" We have held our family reunion at this location for 20 years. The staff is always so accommodating. We each get our own guest room; then also have the conference room as a place for all family to gather. It's wonderful! Our home office is in Ames and whenever we have 2-day meetings, we always book our rooms at the Best Western. They are easy to work with and have clean, updated rooms. The breakfast is very good compared to many continental breakfasts! We were very happy with our stay, breakfast could have been better but it was still good :)the pool was nice and they had very nice seating area outside for smokers and non smokers! We will probably be coming here on our next trip! The Best Western in Ames, IA was fabulous from the renovation - decor, to the fabulous rooms, delicious breakfast, and great location! Thank you for excellent service. We extended our stay and we will be back! First time staying in this hotel when in Ames, Iowa and it won't be the last. When you walk in you have friendly faces greeting you. The lobby is very clean and comfortable. The room I stayed in was a big it had a setting room and a separate room for the bed. The breakfast had a lot of choices . "Best place to stay! " This place is absolutely amazing! The decore is beautiful and the staff where so helpful and cheerful. The beds and pillows were fantasticly comfy and the sinks in the room were absolutely adorable. Especially dor the price its a great deal! We will definitely be coming back to This place! Very pleased with this hotel. Always a great stay! Our family stayed at this hotel several times over the past year and we are always pleased with our stay. Has great breakfast with many options and we love the outside seating areas to visit after a long day. This was a last minute thing for us. We were so pleasantly surprised with the quality of our stay. The most comfortable bed and pillows ever! New and attractive decor. The pool was not big but it did the trick for our kids. Very nice room. "Great for a smaller hotel"
Was there for the university graduation. They were completely full but showed great care to provide the best service. Rooms clean, nice breakfast and terrific front desk staff. Nice pool /hot tub. Very comfortable beds. If you are in Ames IA for a university function, this is a great place to stay. "Our go-to place to stay in Ames"
My family has been staying at the Best Western in Ames for years. Now that I'm married, my husband and I still choose to stay at the Best Western because it is a great value and always clean. It's our first choice, always! Staff was so helpful and very nice!!! Ashley and Mariah rock! Good location, and easy access to whatever you need. The pool area was nice. Fitness area was good, and that is a big deal with me. I would use this motel anytime I am in town. The staff were very friendly and everything was very clean! Breakfast was good with plenty of selection! There is no room service but there are plenty of local places that would deliver. I will defiantly stay here again! "Great hotel, great staff! Highly recommend"
Our basketball team has stayed here every summer since 2013 and we can always count on the BW staff to meet our every need! this year (2017) was no different -- great experience. The hotel's remodeling since 2014 is beautiful ... rooms, lobby, and patio are all updated. The breakfast includes eggs, sausage, yogurt bar, waffles, oatmeal + fixings, and more. The location is good, too, easy to get to and close to lots of amenities. Beds and pillows are not too hard, not too soft. Highly recommend this hotel if you need a place to stay in Ames. It was clean with friendly staff. In the Morning free breakfast had plenty to choose and tasted good. Pool and hot tub was clean. Overall a pleasant and comfortable stay. We would come back again. The only down side was a bit pricey but compared to other choices not bad. We stayed in Ames to take our dog to Lloyd vet hospital. The staff at this property is amazing, they go out of their way to make you comfortable. Rooms were very clean. Beds are very comfortable and the pillows are spectacular! Only complaint is the cost, quite expensive for a non suite room during the week off season.. We will be going back and we will be staying at this hotel. Best Western overall can be hard to predict...so I was pleasantly surprised when I arrived in Ames. Superior and friendly service, an updated and clean property with all the amenities - pool, business center, free wifi, business center, and breakfast! My family and I really enjoyed our stay here. 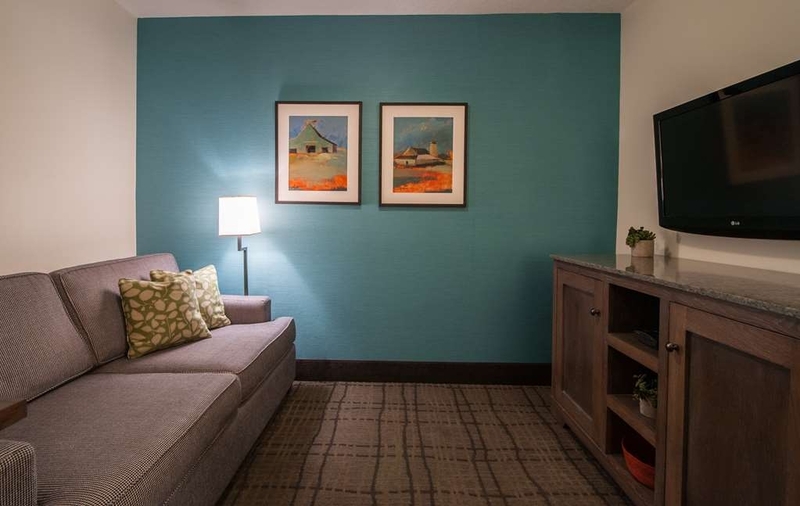 As former Ames residents, our stay at this Best Western felt like returning home. The room was very clean, which was great for our 10 month old who likes to bite everything. Also, the best thing was being able to open our window! We stayed at the Best Western Plus University Park Inn in April. Our King Suite was very nice and the bed was comfortable. They offer a full hot breakfast that was great. We had a little issue with our TV, but nothing major. The staff were friendly. We didn't use the pool or the hot tub, but they looked nice. Our stay at this hotel was the absolute best in terms of service, cleanliness, amenities and helpfulness of staff. The breakfast was great, far above others that we have had during out trip. We would highly recommend this place to others. This place is clean, comfortable, & reasonable. Staff is very, very kind and helpful. Breakfast was fabulous with a nice variety! Located in a convenient spot. Nice convenience store/gas right across the parking lot. Great experience. We were in Ames for an Experience Iowa State visit. The hotel was a short and easy drive away from the central campus area. The hotel was safe, clean, and very comfortable. Friendly, accommodating staff. We booked through Hotwire and were prepared for an okay experience for one night. We were surprised with the cleanliness and how comfortable the room was. The lobby and breakfast area was very clean and a pleasant place to sit. We (family of 4 with 2 teens) stayed for 1 night during a college visit to ISU. We found the lobby area charming, the room very clean and well maintained and the location perfect for our stay. The young man who checked us in was very personable and professional (a college student at ISU). Breakfast was nice, good options for all. We will stay again! The hotel was clean, comfortable and offered a nice breakfast variety and the staff were accommodating and fun! Staff were able to give advice on restaurants and locations which was extremely helpful. "My new go to hotel in Ames"
Stayed here for a football weekend. Had a "suite" King bed with a separate sitting area. 2 TVs, fridge, etc. Very nice. Had a farm/barn theme, done well. Nice porch in the front to hang out on in nice weather. Breakfast was decent. Waffles, eggs, ham, sausage, oatmeal, etc. Common area great to visit in with others. Played cards there with kids one night. Had a nice time. Still renovating hallways. They allow pets, but can look up when a room last had a pet. Good location. C-Store next door is nice has large selection of beer, fresh baked goods and great coffee. Will stay again. "Nice but needs some work "
Clean room. Like the channel sink faucets - nice touch. Breakfast is nothing to write home about, but typical. Very friendly staff and helpful with combining point free room with CC pay. Hallway is older- needs new baseboards but clean. Overall nice stay. "My go-to hotel in Ames"
I have stayed here on multiple occasions. The rooms are clean & comfortable. The recent redecorating looks good. Front desk and housekeeping staff are friendly and responsive. Gas station next door is handy. Breakfast is plentiful with variety. My only gripe, and it is a very minor one, is that the in-room coffee is via a Keurig machine, so tastes, well ... like Keurig coffee (awful). The easy work-around is to get a cup of coffee from the lobby. "Worse stay ever I would give this facility a half 2.5"
Don't waste your money stay somewhere else. When I booked this trip on bestwestern.com I ordered a handicap king suite what I got was a regular king suite with no accommodations for me in the bathroom handicap parking have been taken by somebody without a handicap decal one spot on the parking lot that was all. The first room they gave me was a king suite I couldn't even get in the door for the odor. The second room was was suitable except it had no bathroom accessories for handicap I use a wheelchair. So that meant no shower for me after 15 hours of driving. I ended up with a queen size reg. room with no price change. When you spend $184.00 per night. I expect better service and quality. The room that was booked online was not advertised as an accessible room. We do have accessible rooms advertised but this guest did not book one of them. The guest arrived after midnight and alerted us that she intended to book an accessible room. All of them were already rented and occupied at this time. We were able to move the guest into an accessible room the following day for the remainder of her stay. This room had a king bed, not a queen bed, as none of our accessible rooms have one queen bed. The rates were higher due to it being a high demand weekend with a home football game. While higher, our rates are still lower than most hotels with similar amenities in Ames, Iowa on a high demand weekend. In order to guarantee availability of an accessible room it must be requested and booked at the time of reservation instead of alerting us at check in. We had an excellent experience! Nice Hotel that has been recently updated. Nice staff and very helpful. Easy access to Interstate with many dinning options in the area. I would definitely recommend to family and friends. Everything about this Motel is quality and beauty. I tried very hard to find something that could have been better, but could not find a thing. I look forward to returning during my next visit to Iowa. Excellent, friendly staff, comfortable, breakfast was perfect for a get you up and running breakfast. wish the eggs werent instant eggs and that sausage or ham werent the only two choices,,,throw some bacon in there and ill rate amazing. still though great prices for an excellent hotel. I was pleasantly surprised by the trendy decor inside this hotel. I actually took a couple of pictures for my own decorating inspiration. The room had been recently updated and was very comfortable. The upstairs hallway was under renovation and was the only sign of a previously dated hotel. Located near ISU and just off of Hwy 30, the location was perfect. Not only was the place exceptionally clean but even though it is near a major highway, my room was nice and quiet. The staff was extremely friendly and helpful with any questions I may have had. They were this way with everyone that came through the doors. I really wish I had tried the breakfast but needed to be over at the university and ran out of time. Usually I do not sleep very well in a hotel but I did that night. "Very compassionate and caring staff"
The purpose of my trip doesn't fit into the boxes I'm supposed to check below. I was in Ames to take my very sick dog to the Iowa State veterinary hospital, and this is the closest hotel to that hospital that not only permits pets, but offers a discount. I found the kindness and compassion of the staff very touching at a time of stress and concern for my beautiful girl. "Great Ames, IA Hotel Option"
I stay at this hotel every time I visit Ames for business - 4 stays in the last two months. It is very easy to get to and convenient to highway, Iowa State, and multiple eating options. The staff is very friendly and helpful. I've made use of both the business center and the fitness center. 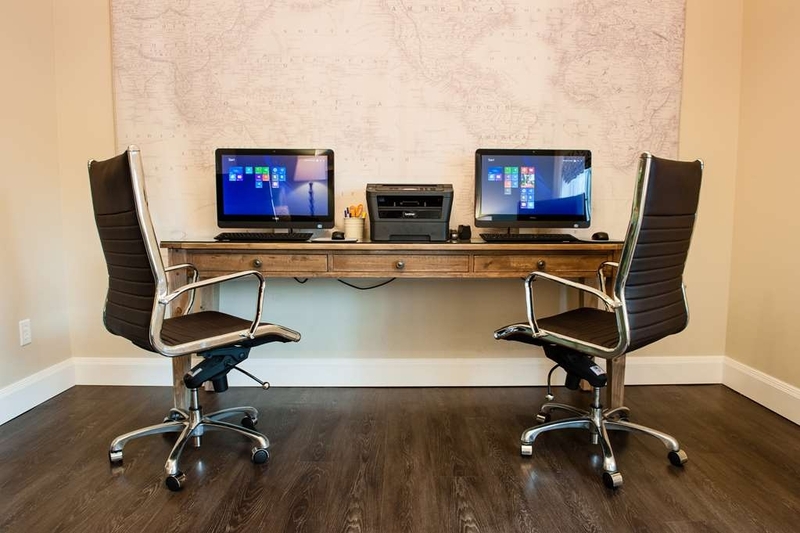 The rooms are very nice and perfect for any needed computer work. The only downside for me is the beds are too soft. My hips and legs tend to ache - must be aggravating some pressure points. I prefer a more firm mattress. Would not hesitate to stay here a million times! The staff were wonderful. Breakfast was hot and delicious! Rooms were clean and beautiful. Was not able to use the pool or hot tub but they looked inviting. Loved the staff! They answered any questions/requests I had cheerfully and promptly. Room was clean and quiet, hotel going under renovations and we hardly noticed. The breakfast was good. Pool is on the smaller side, but the kids enjoyed it non the less. Easy to get to with great access to highways. Will stay again! This is our second stay in two years and yet again it was wonderful! The staff is helpful with great smiles and the hotel is very nice even with a little updating going on. Love the pool and breakfast. Close to everything the family wanted to do in Ames. Well situated, good location, great comfortable rooms, and just well maintained in general. FRIENDLY STAFF!! Loved this stay. Breakfast was very good, definitely above the normal for a continental breakfast. Clean, comfortable hotel with decent pool and hot tub. 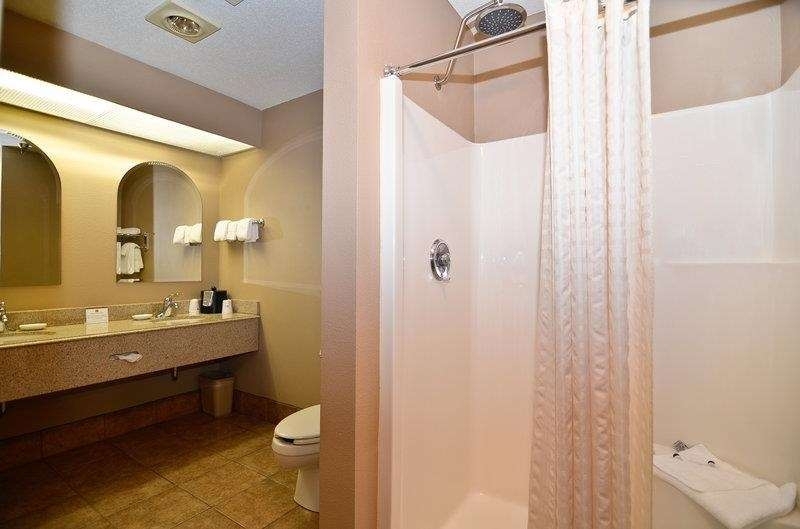 Has a handy microwave and small refrig in room, with Keurig coffee maker for fresh coffee/decaf.. Also has an especially nice sink and mirror located outside the shower/toilet area to help get us ready for the day, including soft towels. The breakfast bar had a good variety of tasty foods including scrambled eggs and waffles which we like. "Family and friends two night stay was good"
We booked 12 rooms for two nights. Unfortunately, it was a weekend of sports events in Ames, so the room rate was a bit high. Some of our group were in rooms that required a long walk to the lobby and breakfast area. They are pet friendly, so one couple paid the $20 fee per night so their dog could stay with them. The staff was friendly and very accommodating. Our group enjoyed spending time together in the lobby with our beer and wine. Our room was very clean and comfortable. We were on the highest floor(2nd), and could use either stairs or elevator. Breakfast was adequate, but not outstanding. Coffee was served from urns, and regular coffee did not seem very hot by 7:30 in the morning. Their location is convenient to Iowa State University campus and downtown. There are numerous paths for running, walking, and biking nearby. Since we were paying for our entire group's stay, it was disconcerting for each room to be given a receipt. At checkout, I requested a total bill, but they were only set up to make copies of the bills for each room. We did not receive an actual bill for the total we were charged. For the convenience of location, we would consider staying here again. "Visiting for youth basketball tournament"
Was very impressed with the cleanliness and price of this facility as well as how safe I felt there with my four kids alone! Breakfast was good and the staff was very helpful but could probably use a little more variety! My children loved the pool! "USATF Regional track meet(July 2015)"
Quiet area on the outskirts of campus. Very friendly and helpful staff. The grounds were very clean, nice pool area, convenience store right across the way . NICE location, Spacious rooms, relaxing environment. A great place to get away and be in peace. I really can't say enough about the staff at this Best Western location. They truly were responsible for making our trip as enjoyable and hassle-free as it was. Even our very limited interaction with the housekeeping staff was noteworthy. The amenities were great, as well! Highly recommend. Clean with very friendly staff. The eggs were a little bland, but otherwise the breakfast was nice. The pool looked great, but alas I did not have time to use it. My son and I checked out the fitness room and thought it looked very nice for a hotel accommodation. "Clean, comfortable, quiet, and a free breakfast, what more could you want?" The hotel was under renovation so the hallway was a little shabby but that's to be expected during renovation. The first floor had already been finished so we could see what was going to be upstairs, and it looked very nice. The elevator is small but it's just about the size you need for a family with their luggage. The lobby and rooms are decorated nicely. The room was very clean and the beds were comfy. The pillows were comfy too. I like a pillow that gives me enough support without raising my head so high that my neck is at an uncomfortable angle. These did that. We had a very nice sized refrigerator with freezer compartment and a microwave in the room. We also had plenty of both cold and hot cups. Many hotels don't leave enough in the room for the number of occupants. The staff is very friendly and they go out of their way to be helpful. We found that to be the case with several of the front desk staff. breakfast was pretty much standard hotel fare; scrambled "eggs", sausage, breads, scones, waffles and oatmeal. They had what looked like homemade oatmeal and it looked very good, along with several toppings for it. They also had cups of vanilla yogurt with fruit and nut toppings as well. There was a waffle machine. The waffles weren't very good but I'm sure kids would like them just fine. There was also what looked like home baked scones, as well as small bagels. There was two choices of fruit juice, milk and coffee. There was a nice variety. A little fresh fruit would have been nice. I saw a long bowl of green apples and started to grab one to eat it but realized in time that it was fake. We had a little problem with the plumbing. It took two flushes every time we used it, but it never stopped up or overflowed. I let the front desk know about the problem so they can address it so the next person in the room doesn't have a worse problem. I'd stay there again. The pool wasn't too bad. It looked like it could benefit from a good scrubbing, but that's the way with so many hotel pools. It wasn't too bad for swimming and the chlorine smell wasn't real strong, (strong chlorine smell indicates the pool is not clean) so I'm sure it was fine. The hotel is a straight shot from, and close to, Iowa State University, which was convenient for us as we were there for orientation. Easy access from highway 30. 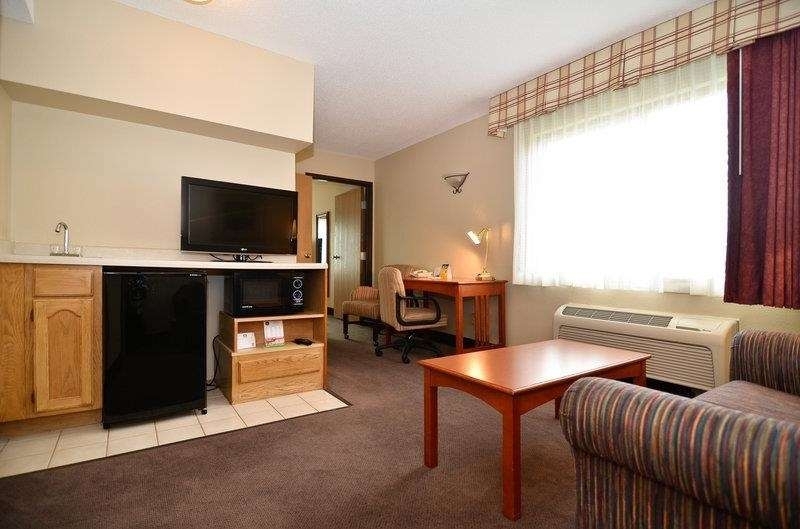 Our king room was just recently remodeled and was very clean and spacious. The bed was nice and comfortable. The full breakfast was excellent. The whole stay was great and if we are in this area again we will definitely return. "Our Stay at the Best Western in Ames, Iowa"
Close to Iowa State University, but you will need a car to get around the university and town. Be sure to go to the downtown Ames area. We had lovely dinners at Aunt Maude's and a true Latin experience at Botenero de Latino. Excellent family hotel while staying at Iowa State University. Extremely friendly and helpful staff. Very close to campus. Great breakfast, lobby, workout room and pool. We will definitely return for fall visits! We had a recently remodeled room so all was in perfect condition, very clean, and comfortable. The breakfast selection was excellent and the food was of good quality. The hotel lobby was pleasant and we enjoyed use of the pool and hot tub. Stayed 2 nights while my ISU student did orientation. Very close to campus. Rooms were small, but very clean. Air conditioner did not work well. We always were short on towels and had to go to the desk to request them. The 2nd morning there was no hot water at all. Not sure what was going on, but a cold shower was not fun. Also the toilet had a trickle noise that was annoying. Overall ok visit. I'm all about the cleanliness and this room was clean. I felt for almost $200 a night things should have been so much better. I probably wouldn't stay here again. When cleaning your room yesterday we found the note you left alerting us to these issues. One of our water heaters malfunctioned yesterday and we were temporarily short on hot water and we fixed the problem. We tried to reach out to every guest but you did not check out in person and we were unable to make contact you. Our general manager left you a voicemail yesterday morning at check out time on the phone number that was on your reservation, inviting you to call back and and discuss this so we could resolve the problem. We would have been happy to move you rooms or fix the problems if we had been alerted them while you were still here. Please check your voicemail and listen to the message we left you yesterday morning. Thank you. We spent one night at this hotel in order to visit Iowa State University. The location was great. Only a 5-10 minute drive to Memorial Union. The staff was very helpful. There is a gas station station next-door which was perfect for filling up the car before we left. I went to Ames for Odyssey of the mind World finals as a judge. I normally stay in the Gateway just outside the University entrance but not this time. my friend and I were sent over to the Best Western directly across the street. We were comfortably surprised with our room. Beds were very comfy to the point we hesitated to even sit on our beds for fear of falling asleep. The lobby is a very nicely decorated country theme and the desk personnel were helpful and knowledgeable. Be prepared for now they are updating the hotel with new paint, wall paper and carpeting. The rooms seem to have all been recently updated and very stylish. The proximity of the hotel to the University is exceptional if a bit ambitious you could easily walk to campus for a game. According to my room mate the hotel gym was nicely equipped and saved him from driving to Des Moines to go to his normal gym. All in all Comfy friendly and convenient. There was some remodeling but did not affect us in any way. We did not use the pool but it looked nice. The front desk staff was helpful and pleasant. Décor was beautiful. Rooms were clean. Breakfast included ham and eggs, yogurt bar and fruit. If you are looking for a place to stay in or around Ames and you care about cleanliness and above and beyond service, this is where you want to stay! I've been staying here at least 20 years as needed and wouldn't consider 'trying' somewhere else. I understood from recent reviews that the hotel was undergoing some updates and renovations, and believe many rooms have already been done. The hallways in our part of the hotel had brand new brightly colored carpet and the walls and lighting were very nice. However we were disappointed that the King Suite we stayed in, room 130, had not been redone in quite some time, and was probably on the agenda to be done soon. The suite had a nice bedroom with a door between it and the other room. The bedroom had a very comfortable bed and a nice TV. It would have been great to have more places to plug in phone chargers on the bedsides. There is one outlet on either side of the bed, each with a lamp plugged in, and one with an alarm clock. The front room had a small counter with a small kitchenette type sink, a Keurig coffeemaker and a TV on it, and a microwave and a small refrigerator underneath. I would expect if updates are done for this room soon, the kitchenette cabinet/counter would be replaced as they were quite run down. There was also a table and a nice desk chair and a comfortable sofa/bed and a coffee table. We really liked the opaque roll down shades and the room darkening curtains in both the bedroom and the sitting room/dinette. The carpeting in both rooms was a dark brownish gray, and didn't look very fresh and clean and we thought it might have been past due for replacement. There was a decorative clock on the wall of the sitting room, but it was damaged with the clock mechanism missing altogether. The bathroom had a older jetted tub/ with a shower, which would be a nice opportunity to soak in deep swirling water, but the tub was an older model and past due for replacement. The pool and hot tub area in the hotel was very nice, bright and clean. We enjoyed that very much. The lobby area was beautifully decorated and welcoming. Breakfast was really good the two mornings we stayed. Pancakes AND waffles, scrambled eggs and a meat choice. We loved the variety of yogurts, cereals, breads, bagels and sweet rolls. The juice, and coffee was very good. The seating area to go with the breakfast area was large and very practical for both large family groups and couples to sit to eat. We enjoyed our stay at this hotel, it was conveniently located to the areas in which we traveled to and from. I am certain our room may have been one of the last areas planned for rennovation, and we would be very interested in staying here again in a King Suite if we had assurances the room has been improved by our next visit to the area. I'm writing this while eating one of the best hotel breakfasts I've had in a long time!! So many choices of good heathy food! My room is large and clean. Recently remodeled. The staff if friendly. Location is kind of tucked away but easy to find. It was nice to have green space outside my window... Which had lovely new blinds. I hope to stay again sometime!! This hotel has just been renovated- it's beautiful! 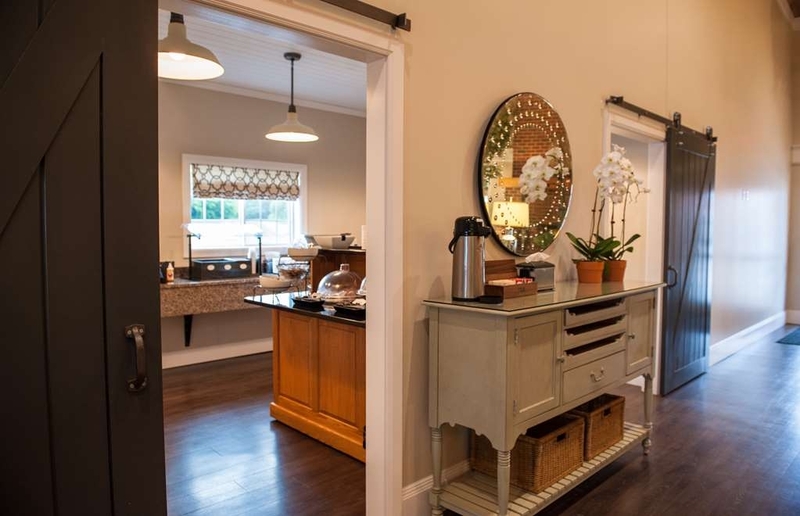 From the rustic charm of the lobby to the redone rooms we could not have been more pleased. The lobby offers a long table to eat breakfast, play games etc. while not a huge area, it gives ample seating even on a busy weekend to enjoy breakfast. Close to campus, walkable to Jack Trice. "Consistently good place to stay"
We've stayed here 3 or 4 times now and it is consistently good- pleasant and helpful staff, clean rooms, a nice pool area and a very good hotel breakfast. The wrap around front porch and the lobby are both nicely decorated with comfy furniture and pleasant touches (candles on the porch at night) that make them welcoming places to relax, meet with friends, etc. A gas station/convenience store is across the parking lot, restaurants are one exit down the highway (or nearby in downtown Ames). Altogether a pleasant place to stay. I was able to check in early at 2:30pm and the front desk clerk upgraded my room to a King Suite for the same rate! Awesome room and great location! Room was very clean and quiet. Breakfast offered many filling options. Breakfast area was clean and presentable. The breakfast is one of the best hotel breakfasts, it has something for everyone. My 8 year old got to have fruit loops, I had the yogurt bar, and my husband had eggs, ham, and toast. We were all satisfied with everything. The beds are very comfortable. Friendly staff. Thank you for a wonderful stay. You are always our choice when we come to Ames. My generation has been coming to Ames to visit our grandparents forever. We all love the campus and surrounding areas. Go Cyclones! I was in town between business trips and came down with the flu. Becca went above and beyond to make my stay as comfortable as possible. She offered an upgrade to a suite as the carpets below my room were being done and was worried there would be too much noise. She also offered to call around town for places that offered gluten free soup. Please continue your incredible caring touches! "Clean and Comfortable with friendly staff"
We chose this hotel due to others reviews. It was a good choice for location for our visit to Iowa State University. Very convenient. The staff is very friendly and the hotel is clean. During our stay they were doing some maintenance - upgrading the hallway wall coverings. There were no issues with the work going on - other than passing them in the halls, you wouldn't know they were there working. We didn't use the pool or the fitness room while there, though both areas looked clean and nice. The breakfast consisted of waffles and pancakes, cereal, fruit, bread, bagels, eggs (powdered kind) and ham one day, sausage the next. There was also hot oatmeal with several toppings offered. Coffee, water, orange juice and apple juice were also available. The best part of the breakfast is the amount of dining space. They have plenty of tables - which is a nice change from most hotels. I agree with some other reviews about the thin walls. They are very thin. Could hear most everything from the neighboring room, including a sneeze. Would consider staying at this hotel again if in the area. "Weekend in Ames Visiting our daughter"
We stayed at this hotel last weekend while we we visiting our daughter. This was the 4th different hotel in Ames we have tried on visits. All where decent, but this place was tops. Wonderful location, close to campus. lobby was bright and comfortable. Staff was very friendly and helpful. Room was clean , beds comfortable, and it was quiet at night. My 15 year old son likes to swim, and he said the water in the room was nice and warm. Breakfast was also top notch. A wonderful weekend, and we will be staying here again on our next visit. From the outside, there is nothing about this hotel that screams stay here. However, on the inside, it is very well maintained and their staff wants you to have a great stay. This is a very clean hotel. The staff is extremely pleasant and their free breakfast is outstanding - serving fresh waffles, eggs and fresh baked scones. The hotel is in a great location, just off Rt. 30, and less than a mile (within a long walk away) from Jack Trice Stadium and Hilton Coliseum. We will definitely stay here again when in town again. "Good Stay but Thin Walls"
We have stayed here several times while visiting my dad. Staff is friendly, rooms are clean, and our kids enjoy the indoor pool. Also, the breakfast is quite nice and included an oatmeal bar that my husband remarked about (which means it was impressive!) Our only problem this particular visit was the thin walls. We were at the end of the hotel farthest from the front desk, near the conference room. We could clearly hear people in the hallway who seemed to congregate in front of the conference room in the morning. This made it impossible to sleep in. At night, the walls were so thin, we could hear the guy next door sawing logs so loudly it woke us up (poor guy needs to see a specialist!) We did find that running the heater helped, as the unit was loud enough to drown out the snores. This was our first negative experience at the University Park Inn, and the rest of our experience was positive so we will likely stay again and be sure to run the air unit! "Very nice hotel with friendly and attentive staff"
Great place to stay, reasonable rates and friendly and attentive staff. Nice comfortable rooms. Cleanliness is definitely a priority here. Close to Iowa State and restaurants. Will stay here again. Breakfast was good and area kept well stocked. Made me feel l a valued customer. I come to this hotel once a year, because of location and ease of parking. With recent renovations the rooms are clean, stylish and the beds are very comfortable. The breakfast was exceptional and included. Waffles, pancakes ham and eggs a yogurt bar as well as hot oatmeal with all the treats. "Pleasant stay near Iowa State University"
Stayed for four nights at this Best Western Plus location. The reception staff was great, and they even checked on the room to see everything was all right, so it made me feel special, which makes a great stay I suppose. Just about everything was above average and pleasant: the hot breakfast offered variety of carbs, drinks and yogurts, a lobby/breakfast area was quaint and spacious, indoor pool and gym were definitely some of the nice perks. Free Ames Tribune (local newspaper) and USA Today were provided in the lobby. Heating, bed, workspace, shower, in-room amenities, inc. Keurig coffee machine, mini-fridge, microwave and more all proved to be quite decent. There's a convenience store/gas station right next to the hotel as well. No proper restaurants within walking distance, except for the one in Gateway hotel right across the street. One complaint I had was the quality of water, which was too soft, thus making the shower experience a little too slippery. Overall, I can see myself going back to this establishment with friendly and professional staff in the future, if I were to come back here. I stay at this hotel once a year for business and it is top rate. The lobby and rooms are remodeled and clean, the bed is comfy, and the breakfast is fabulous. The staff is very friendly and helpful. I will stay here anytime I am in the area. We were in town for my mother's memorial service and several of our family members from out of state stayed here, all arriving on different dates and times. We were constantly gathering in the lobby area to meet and the staff was so patient and pleasant. Exactly what we all needed during such a sad time. Great staff! Wonderful property! Excellent breakfast buffet! Acceptable hotel. Friendly staff. Clean, located right off the Interstate, and 5 minutes drive to campus. No bus o poor bus connection to campus. Breakfast was good, but if you stay more than two days you will notice the lack of variety. Rooms were small and sink was outside the bathroom. I like privacy when I am getting ready in the morning and we had non family members with us so this made it a little awkward. I am also an early riser so since the sink was in the bedroom area I woke everyone up getting ready. Felt the charge was much more than the value. Attended a 5 day meeting and stayed for 4 nights. Room was very clean and great housekeeping service everyday. The entire hotel was clean and staff very friendly and helpful. Used the hot tub and poo one night and was relaxing. Breakfast was good. Had a variety of breakfast items every morning. I enjoyed the taste of the coffee. It was not an instant coffee taste like some places I have been. "Overnite stay at Ames, IA"
We were extremely satisfied with all services received while staying at your hotel. We were only there for a short overnite but enjoyed. Especially liked the free breakfast. The hotel lobby was gorgeous. Helpful friendly staff. Fantastic coffee and made from scratch scones! Not your run of the mill hotel breakfast. Very clean and comfortable hotel. Shower head in bath needed work. Repair was made immediately. Stayed here without researching. Showed up sight unseen. Was happily surprised. Let me list the good stuff. Pleasant staff in multiple interactions. Clean room. I liked the room layout too--had a King bed by the window, then the bathroom, and then a living area by the door. Gave it more of a homey feel. Breakfast area was clean, well stocked, and lots of choices. Pool was warm. If I have the need to stay in Ames, I would definitely stay here again. This hotel has been renovated and looks great throughout inside and outside. Liked having a frig with freezer space. Nice having Keurig coffee maker and microwave. The sink was also updated with contemporary faucets. The beds were very comfortable. We stayed here while visiting our son at ISU and attending a basketball game and will definitely stay here again. It was less expensive than the newer hotels closer to the interstate, bigger room, very comfortable bed, close to campus and apartments in West Ames, and very quiet. Also liked having a gas station/convenience store in the same parking lot. Only drawback was there seemed to be a lack of parking when we arrived back late at night, although that may have been due to the snowstorm that hit while we were at the game. Breakfast was fairly standard but decent selection. Nice staff. The room was clean. Nice bed to sleep and get a good night's rest. I did not use the internet nor the fitness room. Breakfast was included and a bit of variety. Enough to plan another stay! We have stayed in Ames many times, but for some reason never here. That will change as this was a great place to stay and good value for the money. Rooms were very nice, clean and quite. Pool area was nice. Breakfast was awesome. Coming down the stairway to breakfast in the morning felt like we were at someone's home meeting up with everyone in the morning to eat. The staff was nice as can be and very helpful as well. We were in town as a team for a basketball tournament. 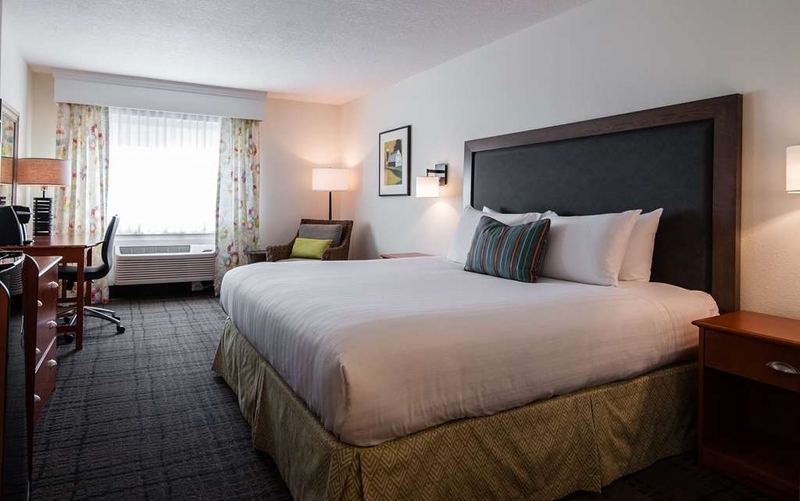 This was our first stay at BWP in Ames and we were pleasantly surprised by the cleanliness and friendliness all around. Our room was nice (not to mention the water pressure of the shower was above average). Breakfast was good. Pool was your typical hotel pool, but the kids enjoyed it. Price was a little higher than we would normally pay, but was a busy weekend so it wasn't completely out of line. Overall, good experience and would consider staying there again. Great except for coffee. Location was great to get to ISU campus. Plenty of seating at breakfast. Pillows were extremely comfortable, and they had a roll-away waiting for us in our room when we arrived. Plenty of parking. We didn't go to the pool area, but it looked great, clean, and nice-sized. Friendly staff. We will stay again. No complaints except for the coffee. The other items at breakfast were right on, though. Just make better coffee, and this place would be perfect! The room was okay. I had a king suite. I was going to the other side of the bed and I saw that there was a big hole in the wall. There is also parts of the wall that is coming off in the bathroom. The service was great, just kind of dirty. "Great Motel, Easy to Find"
Hotel is easy to find, just off the interstate. Hotel staff was very pleasant and helpful when asked. Interior of the hotel was warm and inviting. Rooms were neat and clean. The pool area was nice with a whirlpool and 5' deep pool. The water was warmer than most. I have no complaints about this hotel and would recommend it to anyone staying in Ames. A+ experience. What a pleasure it is to always stay in this little slice of heaven. Any time you are in the area, always pick this place. Everyone on staff makes your stay a welcoming experience. Always stay with them when we are in Ames. This is a relatively modern hotel with clean rooms. The rooms have minifridges which is a neat feature. Most importantly the rooms are clean and smell nice and appear to be well maintained. All in all, I am very happy with my stay and definitely worth using in the future. Wow, what a great hotel. When you first enter it is so charming. The front desk staff is so nice and very accommodating. The rooms have been rehabbed and are very clean, the beds were so comfortable with great pillows. The hotel has a very nice indoor pool and hot tub. Breakfast was OK. Great access to the interstate and the University. Only down side is when they rehabbed the rooms they should have put a new mat in the tub as the new in it looked very dingy. We were staying at motel since we were in town for a conference. We did not spend much time at the hotel except to sleep, have breakfast and leave, but it is a nice clean motel and the bed was very comfortable. I enjoyed the healthy food options they supplied and the topping options for the whole grain oatmeal. This was our 2nd time to stay at this motel. I didn't have a chance to check out the hot tub and pool or the fitness room. It was very cozy, I absolutely loved the feel of the lobby and breakfast was amazing! It was in the perfect location for what I needed and will definitely be going back next time I need a place to stay in Ames. Easy checkin. Very clean comfortable room. The bed was very comfortable with pillow choices.It was nice to have a sink and refrigerator. The coffee was very good. The whirlpool tub worked very well and the water was plenty hot. Breakfast had plenty of variety including oatmeal with several toppings, eggs, sausage, pastries, juices, bagels and toast. It was nice to have hot water for tea. We would be very happy to stay there again. The remodel was a welcome surprise as we've stayed at this hotel before. Always great service and pleasant accommodations. Also appreciate that they allow pets as we often travel with our dog. Staff is always friendly and breakfast is good. Perfect location for a regular trip we take through Des Moines. Easy to access. "Solid night's sleep & very nice accomodation!" This hotel is very near campus and close to downtown. Access to & from is quick. The hotel is immaculately maintained and the rooms modernly appointed. Wifi, TV, Keurig coffee - all worked perfectly. The breakfast was fantastic! Lots of choices & hot! Housekeeping is A+ here and we had a bed/mattress from heaven! Awesome sleep! We would stay here again anytime! 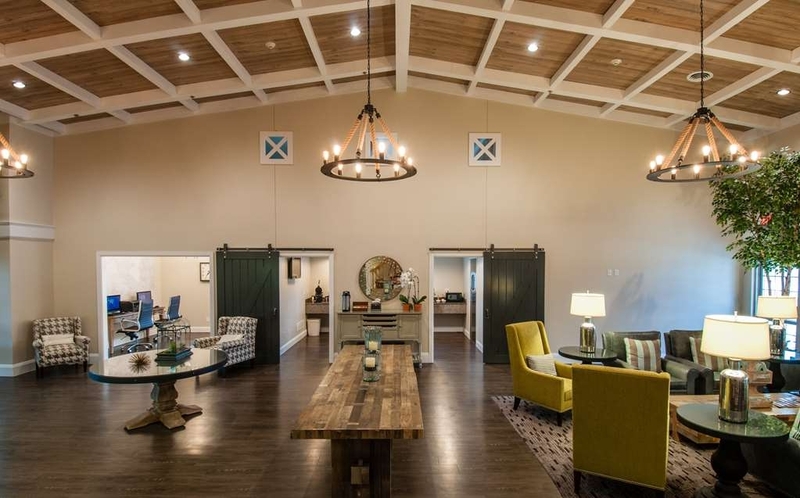 Beautiful remodel of this hotel lobby and rooms! Was glad to see Breakfast had some healthier options that were delicious! Have always enjoyed staying here as it is a great value for a great location. I loved the new Design in the rooms. The remodel in the Lobby and the Breakfast area is very nice. Breakfast was hot and very tasty. We compared price to The Gateway which is where our all day meeting was at. Higher per night for a room that was not as nice, and they only offered breakfast in a very small resturant, which was not included in the price of our stay. I've lived in ames a long time and alway thought this place suc. It doesn't look nice, has a shoddy parking lot that shares with a dirty gas station. I used a site that gives you the hotel name after you buy and had a frown when this hotel was what I got. Upon arrival the desk was really nice. Although this is ames so of course they were nice. The room was upstairs down a super long hallway. Oh my goodness, the room, not at all like my impression gave me. It was nice sized, ultra clean, smelled and looked brand new and was pretty much awesome. Overall nothing to write home about but wow, it is for sure better than some better name hotels I've been at in ames and the price, while discounted, was about half what it was probably worth. A downside was that breakfast was really really bad. Overall especially given the price I did get this is a 5 rating for sure. Great location next to ISU with clean, comfortable rooms and facilities. The lobby area is charming and feels like a home lounge room and was a lovely place to relax at the end of a long day. Best of all though were the staff. Every one of them was helpful and courteous and knew what we needed even before we did. They were an absolute credit to the hotel. We couldn't have been happier with our stay there. Very friendly staff and comfortable hotel. Easily accessible from Highway 30 and close to ISU University. The breakfast is a nice mix of cold and hot food choices. Even though both are small, there is a nice pool and fitness facility. "Good place to stay and reasonable price"
The location is great, near technology companies and University of Iowa. Plenty of restaurants nearby. The breakfast and other amenities were standard for best western. I would recommend this hotel if you are in the area and looking for a good value with comfortable bed and all that you need. First time visit, slept great!! Being in the hospitality industry myself I am very picky with hotel stays, this exceeded my expectations, very clean rooms, amazing breakfast!! Shout out to all the friendly staff with a special mention to Sadie and Stevie!!! Great job!!!!! The motel was clean. The staff was friendly and helpful. I got a good nights sleep. Good breakfast in the morning. It has a workout room and swimming pool. It did not smell like chlorine. It smelled good, looked good. Good experience. It is close to the University. The Front Desk staff is delightful, always a warm welcome & very quick to complete any requests you may have. The rooms are large, very clean, modern & have comfortable beds. I would recommend staying at this hotel! Second time we have stayed here with a group, everything was good, pool was warm, staff were friendly and helpful, beds are comfortable. We had 14 people in 4 rooms (4 families) for a birthday party. The best thing is being able to use the eating area for our group get-togethers. Breakfast was good too. Great stay! "Good place with great rates"
We stay here on our way to Minnesota usually once a month. The breakfast is decent. The beds are comfortable and its close to several good restaurants. The price is always fair and its a pet friendly hotel, which is very helpful to know for people who travel with pets. The first time I've stayed at a best western plus this hotel exceeded my expectations. Very clean, super close to campus and super friendly staff. The King with pull out sofa (2 room) option worked perfect for our family. Surprisingly great breakfast - something for everyone. This past weekend was my third time in three months staying at this hotel. All my stays have been related to my son attending Iowa State University. This hotel is priced right, very clean, up-to-date, and has friendly and attentive staff. First time I've stayed at a best western plus - i've stayed at Country Inn and Amerinn in Ames - this hotel exceeds the other two. Very clean, super close to campus, surprisingly great breakfast and bed, super friendly staff. LOVED the King with pull out sofa (2 room) option. "Great Hotel. Close to Iowa State. Quiet. Good breakfast"
Never stayed at a Best Western but it was recommended by the Veterinary Hospital of Iowa State. We drove here for our dog to receive care at the Vet Hospital. Pet friendly hotel, though we never saw another animal. Excellent customer service. Friendly and helpful staff. Good, free breakfast. Make your own Belgian waffles with fresh fruits. They also have a " rewards" program, which is nice as we will be back again in 3 weeks. We had such a wonderful stay here. Beautiful lobby and rooms were very clean. I worked with Tim to coordinate the rooms for the wedding guests and he worked so hard to make everything perfect, and it was. All the staff was so nice and accommodating for all our needs which made it so much easier for us during the stressful part of weddings. I would recommend this hotel to anyone. This Best Western exceeded my expectations! Very nice modern decor in the lobby and room, comfortable bed, fridge and microwave in the room. I enjoyed the spacious bathroom, and variety of things offered at the free breakfast!